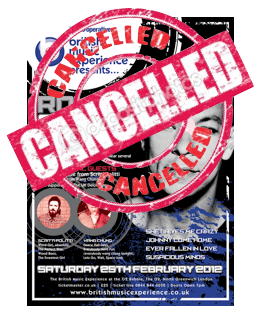 bibbly-o-tek » Blog Archive » Feb 25th live show at the 02 cancelled! Feb 25th live show at the 02 cancelled! Due to reasons beyond the control of the British Music Experience, the promoter and Roland Gift, this event has been cancelled. Ticketmaster will automatically refund all tickets booked for this event to the credit/debit card used to book. If you would prefer to speak to Ticketmaster directly, please call their Customer Support Team on 08444 999 999. The lines are open Monday to Friday from 10.00am to 8.00pm and Saturday and Sunday from 10.00am to 4.00pm. Please have your booking reference and credit card details ready. Link here for more info. Hey there fellow Scritts – I haven’t seen any info (although I could well have just missed it…) about the April gigs at Bush Hall, or the very low key one I found out a couple of days ago at The Lexington in Islington in March. Happy to provide details if you like!